Sitting on my desk are two ceramic pieces that I’ve been looking at off and on for several months. Prior to sitting on the desk the same two pots sat for many earlier months on the mantle in my office, and as I worked I’d regularly stop and look at them. One, made by Richard Hensley, is a rather pointed symmetrical oval form twenty inches long by twelve inches wide at the midpoint by an inch and three-quarters deep. It could be used as a serving dish or as a stunningly elegant swimming pool designed for a miniature world. 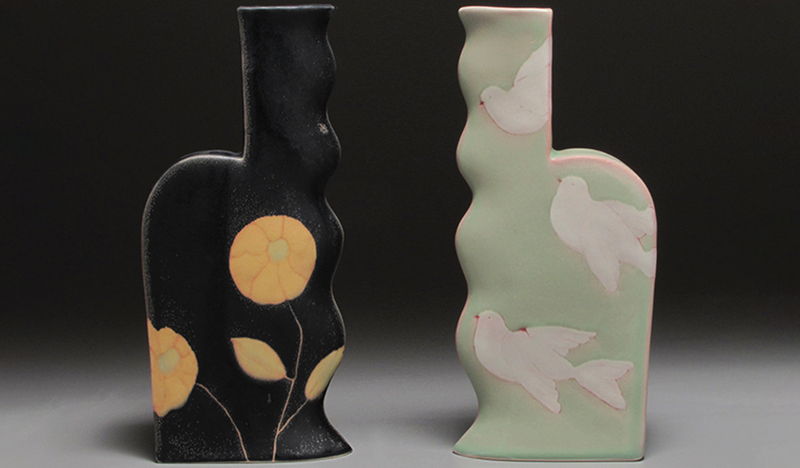 The piece is glazed in a range of beige tones going from matte mustard yellow through a very delicate almost rose color. Two plants with grayish white leaves and seedpods heading toward blue decorate the bottom of the dish. Flowers but I don’t know their names. The seedpods are about to explode sending their seeds everywhere.